Welcome to the Century House Carpet Bowling Group page. 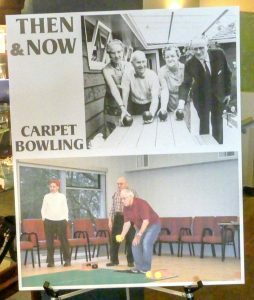 What We Do: Carpet bowling has been a popular activity at Century House since before 1989. At that time there were as many as 6 to 10 carpets in play. Century House teams participated enthusiastically in various Tournaments around the Lower Mainland. Over the years the membership slowly fell off as members aged, moved away or experienced changes in circumstances, until only 6 to 8 regular players remained. Recently, the group is seeing a resurgance of interest and now have approximately 15 regulars members. Important to Know: The game is played on a long ‘felt’ carpet. Each team has four players and 2 teams compete on each carpet. Other equipment includes a small white ball called a ‘jack’ and larger black and brown balls – 4 per team. The jack is rolled to a position on the carpet and then each player takes turns rolling the larger balls to try to get as close to the jack as possible. It is a game of skill as well as strategy and control. The play proceeds from alternate ends of the carpet. Recently, a seniors’ home in Burnaby wishing to start a Carpet Bowling group contacted the Century House group seeking information on obtaining equipment. After some discussion, the Century House group voted to donate one of their surplus carpets and ball sets to the Burnaby group. The members also visited the new group to explain the rules of the game and share some of their expertise and experience. Two of the Century House members have continued to visit the Burnaby group in a mentoring/advisory capacity. Although no longer participating in Tournaments, the group welcomes new members and visitors to enjoy a stimulating time of fellowship and friendly competition. When Do We Meet? :Monday and Wednesday mornings 9:30 a.m. – 11:30 a.m.
Our Club Procter-Harrop Senior Branch 118 is looking for new carpets and unable to locate a supplier.